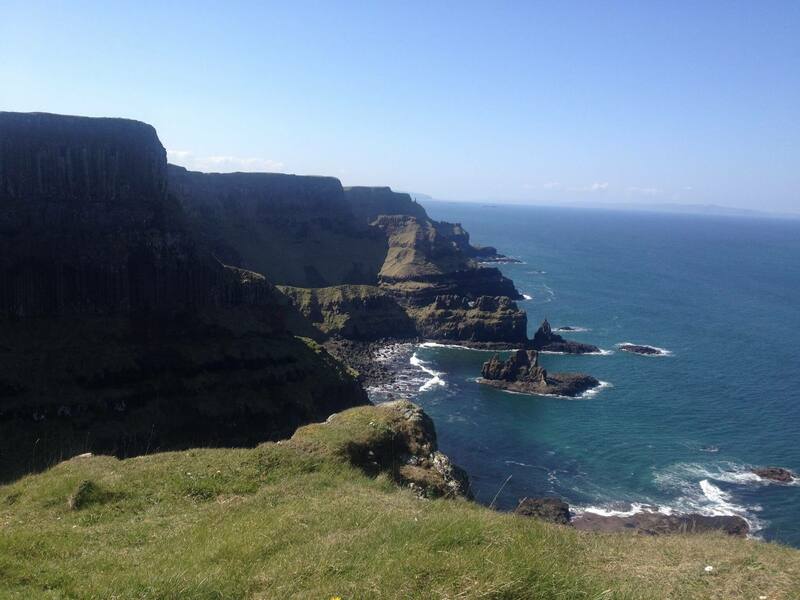 Specialising exclusively in the Causeway Coast and Glens, you won’t find a more locally based walking holidays company. One of the most beautiful coastlines in Europe to walk. All the ease of enjoying a beautiful walking break with none of the hassle of figuring it out. A destination guide full of local knowledge and sources of assistance from the best places to eat to a list of all the local taxi companies. 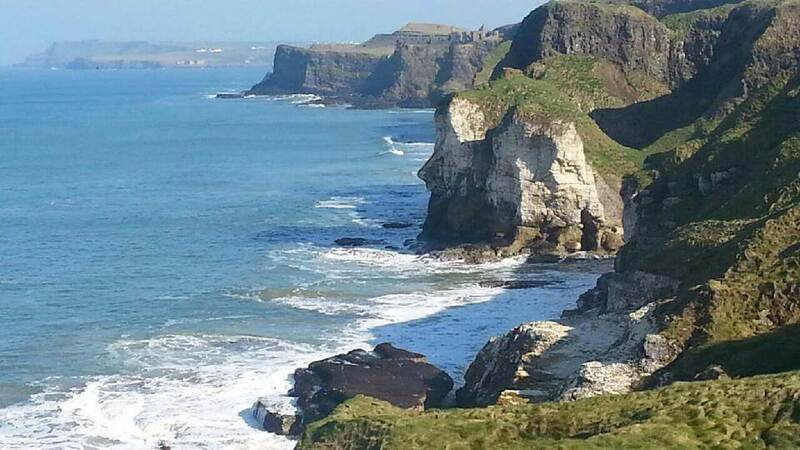 Twenty seven miles (43k) of some of the best continuous coastal views in Europe are available on foot along the Causeway Coast Way. The route is a long distance, almost entirely off road, coast hugging showstopper of a hike that should be on the ‘must do’ lifetime walks of any avid hikers bucket list. Given how extraordinarily beautiful it is, it is remarkably underused and relatively unknown…. at the moment. Make this year, the year you walk this route before the rest of the world knows about it. Arrival town Your first night will be in accommodation in the beautiful coast town of Portstewart from where you will start your walk the next day. Departure town Your final night will be in Ballintoy. 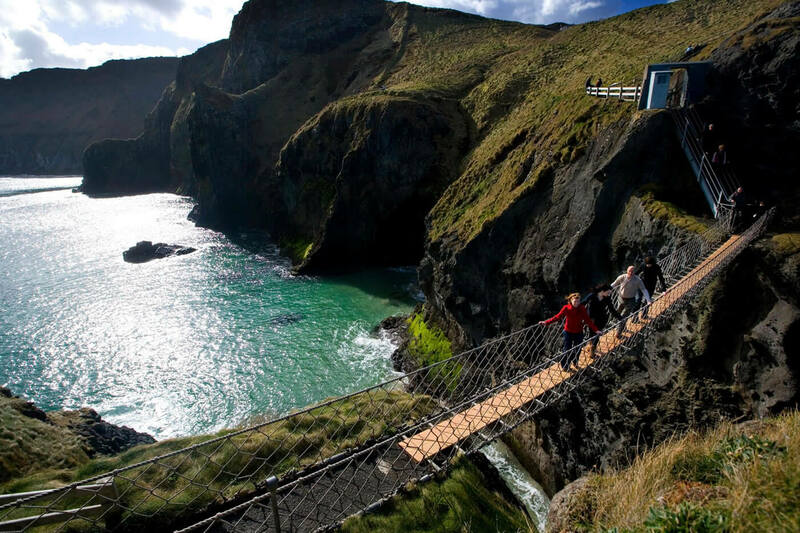 We suggest you leave time in your itinerary to cross the Carrick-a-Rede rope bridge the morning of your final day. Getting There Portstewart and Ballintoy can be reached by public bus or taxi from the coast town of Coleraine. Coleraine can be reached by train from Belfast. Belfast can be reached by bus or train from Dublin. Please enquire about private airport transfers if you prefer. Bring Weatherproof clothing and good walking boots plus a light day pack. In addition you can bring one bag up to 20kg which we will transport for you each walking day. Availability Due to the mild climate, walking holidays are available year round but are best enjoyed March to October. Sue Hoghton April 2015, England. Geoff Stringer May 2015, England. This 3 night independent walking holiday is our best seller. Walk this famous coastline on your own schedule. The routes can be split across three walking days if that is preferred. The route is served by a frequest public bus so it is also easy to shorten any walking day. Along the way there are plenty of sights to enjoy. Directly on the route you can visit Dunluce Castle ruin, the UNESCO World Heritage Site of the Giant’s Causeway, the beautiful harbour of Ballintoy (used in the Game of Thrones) and you can cross the Carrick-a-Rede rope bridge. In addition a short distance off route you might like to add in a visit to the oldest whiskey distillery in the world in the town of Bushmills. 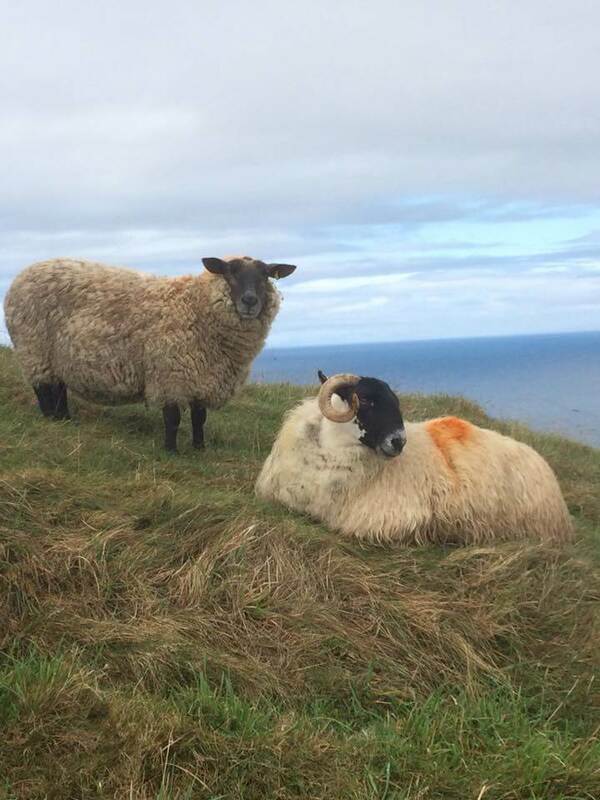 The scenery along the entire route is amongst the most beautiful coast and cliff scenery in all of Europe, Irish coastal towns and villages, four stunning beaches, world class golf courses, UNESCO sites, stunning high cliffs, miles and miles of farmland with grazing cattle and sheep. See an abundance of sea, plant and bird life, some of it very rare and enjoy a remoteness that is hard to find in modern Europe while still within easy reach of transport of lovely Irish bed and breakfast accommodation. In the evening choose from a wonderful range of world class places to dine and socialise. Arrive at the beautiful coastal town of Portstewart, make sure to leave plenty of time for an evening stroll of the beautiful Portstewart strand and why not book dinner in the award winning Harry’s Shack. Stay in a hand-picked, authentic Irish Bed and Breakfast. The full hike option is a 13.4 mile (21.5k) hike from the Portstewart promenade (or can be longer starting at the strand). Walk along the coast side of the golf course arriving at one of two beaches which wrap around the town of Portrush. Depart Portrush by walking along the gorgeous east strand at White Rocks. Just out of sight, over the dunes is the famous Royal Portrush, one of the top golf courses in the world and soon to host both the Irish Open and the Open championship. Taking the path at the end of the beach you emerge onto one of the few road sections of this route. The views remain outstanding. Walk along the road until you come to the majestic 15th Century castle ruins of Dunluce. Make sure you get a photograph with the beach you’ve just walked in the background of the castle. Continue into the coastal village of Portballintrae and take the boardwalk over the river to the tramline, following the path for the Runkerry headland. Your hike ends at the Giant’s Causeway visitor centre. Have a pint in the Nook bar before heading to your nearby accommodation. 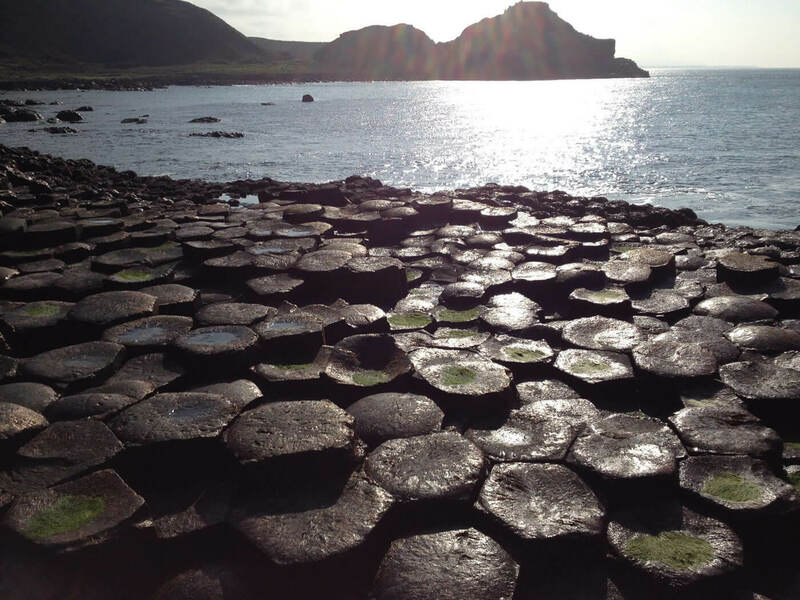 Don’t visit the famous stones yet, you can start your second day with a visit to the Giant’s Causeway. No large coastal towns today. Pack a great lunch and head off for an entirely off road, coastal path of outstanding views. This is the showstopper day which begins with a walk down to the honeycomb shaped rocks of the Giant’s Causeway before continuing on up the Sheppard’s steps and following the high cliffs to Dunseverick. You’ll not miss the wooden bench at Hamilton’s seat. Rest and take in one of the most remote yet utterly astounding, award winning, cliff views in all of Europe. As you reach Dunseverick harbour you might like the idea of stopping off for a brief swim in the rock pools before heading toward the tiny hamlet of Portbradden which must have one of the best beach views anywhere. White Park Bay stretches out in front of you with views of Rathlin island and mainland Scotland in the distance (if clear). The white church on the headland way up ahead is right beside your destination for the day, another charming Irish bed and breakfast, rest up before heading into the village of Ballintoy for the evening or take a taxi round to Ballycastle. You may or may not have time (or energy) to walk on a little extra to enjoy the famous rope bridge crossing. What are the booking terms for walking holidays? We require 20% deposit to secure your holiday. Full balance is required 8 weeks prior to your tour taking place. If the full balance is not received 8 weeks prior to your holiday, you will be deemed to have cancelled your tour and your deposit will be forfeited. We will send you your full travel pack 4 weeks prior to travel. We can accept payment by paypal, BACS, or International bank transfer. Is my money safe? – What about the Travel Package Regulations? In line with the 1992 Travel Package Regulations your money is held in a special trust account until your holiday is completed. Our tours and holidays are designed for people who enjoy being active in nature. Activities in the outdoors always carry an element of risk. All our guides are highly experienced and are qualified to the necessary level required for each tour, including having first aid training. Please inform your guide if you have any medical condition that may impact your tour. Mobile telephone signal is extensively available on the vast majority of our guided and independently guided tours and holidays. Nevertheless for independent walkers we recommend that you inform family or friends of your route and your expected time back to your accommodation. If car hire is part of your package there will be additional conditions of booking. Please read all of the information regarding car hire in your travel pack. Holiday cancellations will incur a 15% admin charge up to 45 days before the trip. After 45 days there is no refund available. Tours are not booked and confirmed until a 20% deposit has been received. Changes to tour bookings will incur a £50 charge. We strongly encourage all our customers to have adequate travel insurance to compensate for unforeseen cancellations etc.